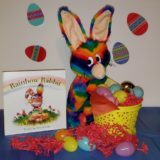 Through the lessons taught in Rainbow Rabbit, children learn that they must remain true to who they are, no matter what the obstacles or pressures might be in their path—or as we like to shout, Color Me Kind! Now, our furry friend’s dynamic, vibrant slogan is now available in an exclusive coloring sheet! With #GivingTuesday taking place just five days after Thanksgiving, the Rainbow Rabbit organization is thankful for those who helped us achieve some important milestones in 2017.